Lanier & Associates is a multi-disciplined engineering firm that specializes in industrial marine projects with civil, structural, mechanical, electrical and instrumentation engineers on staff. In addition to our complete array of engineering services, we also perform topographic and hydrographic surveying, construction management, permit acquisition, facility inspections, and vapor control system design and certification. For over 40 years, our principal clients have been major oil and chemical companies, liquid, bulk, and LNG terminal companies, in addition to construction companies and port authorities. 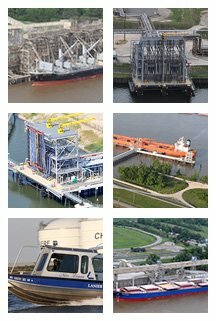 We are experts in all facets of marine terminal design for liquids, grain, other dry bulk products and general cargo. Although we have successfully served clients throughout the U.S. and in numerous other countries, most of our projects have been in the Southeastern U.S., primarily along the Gulf Coast and the industrial waterway corridor feeding this area. In addition to developing new projects, we have successfully performed the evaluation, upgrading and expansion of older marine facilities. We consistently provide reliable, cost effective engineering solutions to our clients because we have successfully merged our strong construction background with a full range of highly refined engineering services.